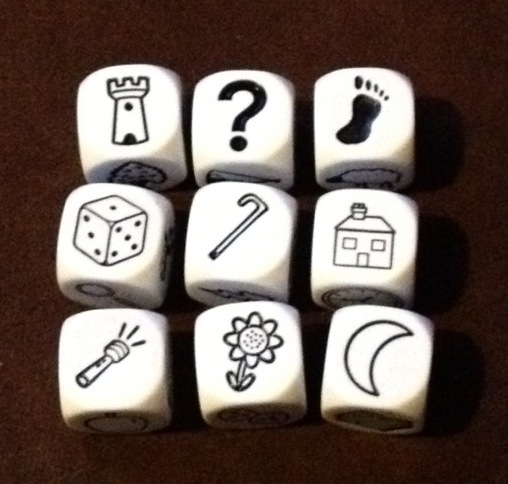 He received the dice as a Christmas present – the challenge is to come up with a story featuring all these components. Now the first thing I thought when I saw this was “Famous Five”. Must be something to do with the flashlight and the moon and the castle, but I think mostly the footprint. You have my permission to psychologically assess me based on that impression – I wonder why I went for all the corner pieces first! I feel 100 words won’t do either this challenge or the components of this story justice, so I’m planning to write something a little longer in resposne to this picture. I’ll post it when it’s done. If you would like to join me, feel free to post your own stories either in the comments below, or in your own blog with a link in the comments. I won’t be reading them until I’m done mine, but then I would love to see what other people saw in Dana’s Dice. Take a group of writers, give them a selection of words, and what do you get? At the Drabble launch event I attended recently (see previous post Awards versus Rewards), the tables were each covered in a series of slips of paper. Like Fridge Poetry, each slip contained a word (or occasionally a word-ending like “ing”) and could be shuffled around to make sentences, poems or even full drabbles. Within minutes of arriving, people had drifted towards the tables and were frantically / intently / happily rearranging the words. It broke the ice – people were bonding over the hunt for a verb before they even exchanged names – and it was a lot of fun. Maybe other groups wouldn’t have found it so absorbing, but writers are wordsmiths; playing with words is what we do. The results were funny, “Why are gourds bananas and a kiwi following us”, and profound “Love said little many times never heard” and downright bizarre “always follow your second best pedagogy”. It’s made me think maybe I should invest in some magnetic words to aid my procrastination. Off to www.magneticpoetry.com methinks!